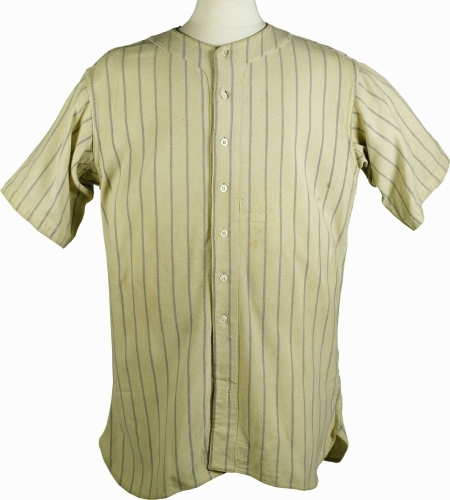 After spending several years on display in Washington DC's MCI National Sports Gallery, this fully documented Babe Ruth game-used home jersey came up for auction in 2006 and fetched a “Ruthian” sum of $657,250.00. 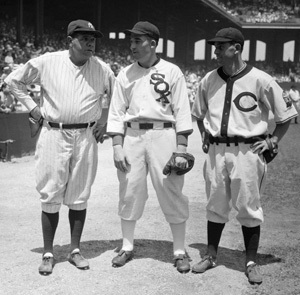 This was actually a steal, since only five actual Ruth gamers survive to this day, and there is indisputable photographic evidence that places this jersey on the sturdy back of “The Bambino” on July 6, 1933, the day of Major League Baseball's very first All-Star Game on Chicago’s south side. 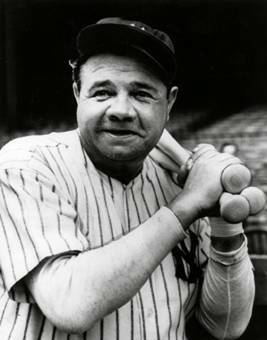 Statistics tell us Ruth notched 34 of his 714 regular season long balls in 1933. This means he knocked eight or nine into the Bronx cheap seats while s porting this shirt, which was one of only two No. 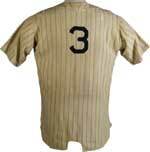 3 pinstriped home jerseys issued to The Bambino in 1933. The chain-stitched "B. Ruth" to the right of the Spalding tag is still very legible, although it has faded over the decades. Though Ruth was in the twilight of his career, he still remained the sports’ biggest draw, even to other players. National League starting pitcher “Wild Bill” Callahan was positively giddy about his brush with greatness. "We wanted to see the Babe," he said. "Sure, he was old and had a big waistline, but that didn't make any difference. 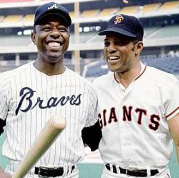 We were on the same field as Babe Ruth." Timed to coincide with Chicago's "City of Progress" Exhibition, this game would be the first time many Midwesterners would see “The Sultan of Swat” in the flesh, and he lived up to his legend, clubbing the first ever home run in a Midsummer Classic. It should be noted that the ball that Ruth sent into the outfield bleachers that day sold for $805,000 in a July 2006 auction. In 1970, Hank Aaron was an aging 36-year-old and deliberating retirement. But he fought through injuries and bigotry for seven more years, to hit a total of 755 home runs and take his rightful place as arguably the greatest pure home run hitter in Major League History. 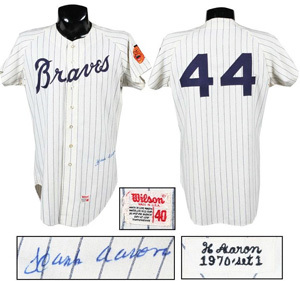 Aaron sported this basic Braves flannel throughout the 1970 season and in the Fall Classic. Minus the classic Tomahawk, which would not return until 1987, the Braves’ home jersey closely resembled Yankee pinstripes. The screaming Braves’ patch, which adorns the left sleeve, added just the right touch of color, and the flannel collar swatch proclaiming in delicate calligraphy that this shirt was worn by “H. Aaron 1970” solidifies its historical legacy. As a bonus, “Hammerin’ Hank” signed this gamer on the lower left front tail at the conclusion of the season.